Retired carpenter Ralph Heading will lead an artist talk on Oct. 6 about his retro-futuristic artistic creations. Artist Ralph Heading will bring his steampunk vision for an artist talk at the Surrey Art Gallery on Oct. 6. The contraptions that Ralph Heading builds in his garage in Boundary Bay certainly look like they could actually work. They’ve got wheels, sails, engines, lights, wings, suspensions and buckets of Victorian-era character. Steeped in a fantasy 19th century world of copper, steam engines and wild imagination, they bring a Jules Vernesque vision to life. “What I do is echoed in Steampunk,” says the 70-year-old retired carpenter. 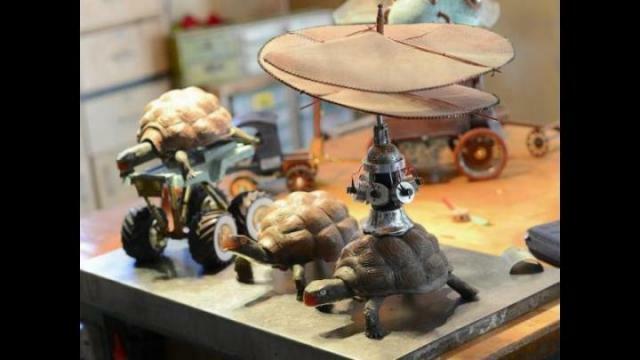 Preparing some of his items for an upcoming artist talk at the Surrey Art Gallery, Heading has lots to choose from to bring: Tugboats, flying saucers, steam-powered wagons, robots, divers and turtles with mobility aids provided by his imaginary Industrial Revolution. Heading is fascinated with contraptions powered by things that pre-date the internal combusion engine. More often than not, steam power and animals are involved. And while most of his dozens of creations look metallic and heavy, they’re often made of styrofoam, sometimes light enough to hang from the ceiling by a single string. Heading says he loves the colour of rust and patina (the tarnish on copper, brass and other materials) and often makes his own “fake rust” to add to objects made of foam, compressed paper towels, wood, or ceramic (courtesy of some pottery training). His creations are all augmented by discarded household hardware or plumbing materials, often provided by “care packages” from acquaintences cleaning out their own garages. He’s used metal tea filters for his “jet engines” and bullet casing for vehicle suspensions and exhaust pipes. “It’s just… junk,” Heading says. About the only “new” technology he uses are LEDs to give his contraptions character in the dark. Heading, a longtime volunteer with the Canadian Executive Service Organization, has travelled across the world (not in 80 days) over the years to share expertise in developing countries. He says he was impressed and influenced by creativity and resourcefulness of South American artists – particularly those making their livelihood by selling hand-crafted things to tourists. Heading took some of their make-something-out-of-nothing philosophy home, adapting it to his fascination with the steam power era, and his subsequent retro-futuristic creations. Unlike the artists he met in South America, Heading doesn’t have to do this for a living.